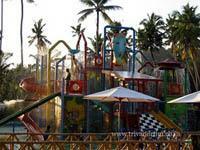 Happy Land Amusement Park is a fun-filled place and it is south India’s first water theme park. The park has many rides to offer to its visitors as well as provides all the necessary facilities. Read more to know about the information, rides, timings, rates, discounts, events, address and official website of Happy Land Amusement Park. 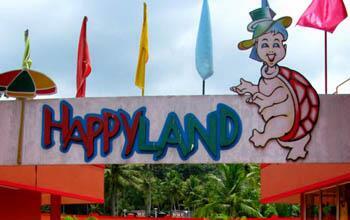 Happy Land Amusement Park is situated in Vembayam 23km from Thiruvananthapuram city of Kerala. The park offers many thrilling rides to its visitors making their trip very enjoyable and a memorable one. It is south Kerala's first water theme park and was inaugurated and opened in 2005.The amusement park lies amidst nature with a lot of trees, hills and waterfalls in the surrounding areas. Happy Land is the only environment friendly that is eco-friendly water theme park in Thiruvananthapuram. The park has been built in such a way that it does not disturb its natural surroundings and keeps it in its unspoilt form. The lush greenery that encompasses the park gives a comfortable and relaxing feeling to the park's guests. Some of the famous picnic spots of Thiruvananthapuram are also located near the amusement park. This is the reason why Happy Land Amusement Park is enjoyable all around the year irrespective of the season and climate. The combination of the stunning location and the thrilling rides that the park offers makes it must-visit place in your agenda during a vacation to Thiruvananthapuram. The park is also well-maintained with a lot of care given to cleanliness and hygiene. Happy Land offers many exciting rides to its visitors which are suitable for people of all age groups. The park also organises birthday parties, family get-togethers, product launches, marriage parties and business functions. The staff of Happy Land are very skilled in the organisation and hosting such events making the amusement park the one-stop point for all sorts of entertainment. Some of the unique features of Happy Land Amusement park is that it offers the longest uphill water ride in Kerala and the largest wave pool in Kerala. Families can enjoy together to the maximum in the family pools provided by the park. 1. Uphill water ride - It is India's longest water ride. This specialty is enough for one to realise the excitement and thrill that this ride can offer. It is a huge water ride where one is sent through high altitudes, tunnels etc. 2. Wave pool - This wave pool is basically similar to any other wave pool found in other water theme amusement parks but a unique feature of the ride in Happy Land is that it is the largest wave pool in Kerala thus making it much more enjoyable and exciting. Some of the other rides found in Happy Land are Aqua trail, Multi-water play system, Rocky falls, Family pool, Crazy cruise, Multi-lane, Pendulum, Akash, Kuhu Kuhu Express, Pushpak, Columbus, Smash, Challenger, Ball pool, Cro cro, Butterfly Roundabout, Blue wind, Flower basket and shoe slide. The rides meant for the kids are kept in a separate section of the park called as Kid's village. This section is set amidst the backdrop of the sea shore and has unlimited fun-filled rides and activities for the young ones. Some of the facilities provided by the amusement park are high class restaurants, changing rooms, locker facility, coffee shops, ice cream parlor, parking area, telephone booths, curio corner, first aid areas and toilets. There is also a kids village and an art gallery exhibition where one can admire and also buy paintings of famous artists. Shops which sell t-shirts, hats and many more items is also available in the premises of the park. Timings from Monday to Sunday - 10.30am to 6pm. Special discounts are offered for school packages and visitors coming in large groups.